What more in Kingdom Rush MOD? Kingdom Rush is one of the best tower defense games on mobile with about 441000 rating on Google Play. This game is the first product of the tower defense game series of Ironhide Game Studio, released for free on the App Store on October 1, 2012 and next is the Android version in May 2013. With the huge number of players every day, it is no surprise that the game won the first prize at the Videogame competition held in Uruguay in 2013. If you love strategy games, especially tower defense games, Kingdom Rush is a great choice that you can not ignore. Before you install, please go down to the article section to find out some interesting things about this game. The graphics of Kingdom Rush are pretty well designed in a simple 2D world. Thanks to that, the game runs easily on all Android and iOS devices. The game transforms the entire experience of the player from the PC version to mobile devices, so you can hardly find the difference between the two versions. Orcs and monsters in the game are quite small but still have the characteristics to help players distinguish. The game is particularly concerned with the sound, which is demonstrated by the fact that they have invited Sean Crisden to voice the game. 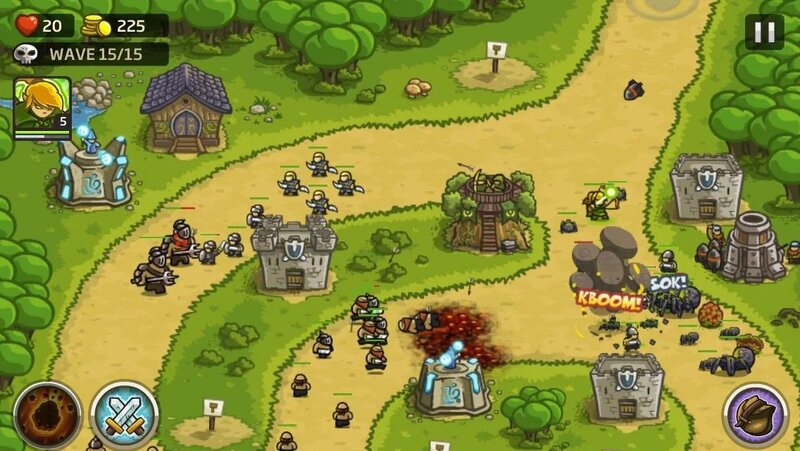 Kingdom Rush set a plot in a medieval where epic battles between humans and monsters such as Orc, Evil, Witches, etc. You are the last shield of the kingdom. Fighting, try to stop them attacking your kingdom by designing defense tower and the best warriors in the most important locations. The map of the game is quite large, but you only need to care about the main road because the monsters will attack that way. Each level design “Strategy Points” at fixed positions, where you can place defensive towers. There are four basic tower types to choose from including Ranged Towers (also known as Archer Towers), Barracks Towers, Mage Towers, and Artillery Towers. In addition, the game also has eight other special types of tower purchased with cash. In addition to building towers, you can summon warriors and mercenaries or even use ancient spells. The defense tower will help you stop the attacks of monsters. Remember, you are not allowed let a monster to pass your base. If the monster crosses the end of the path (defensive point), the game will end and you have to start from the beginning. At some time, you will realize that your towers are not strong enough to stop the monsters, that is when you need to upgrade your towers. 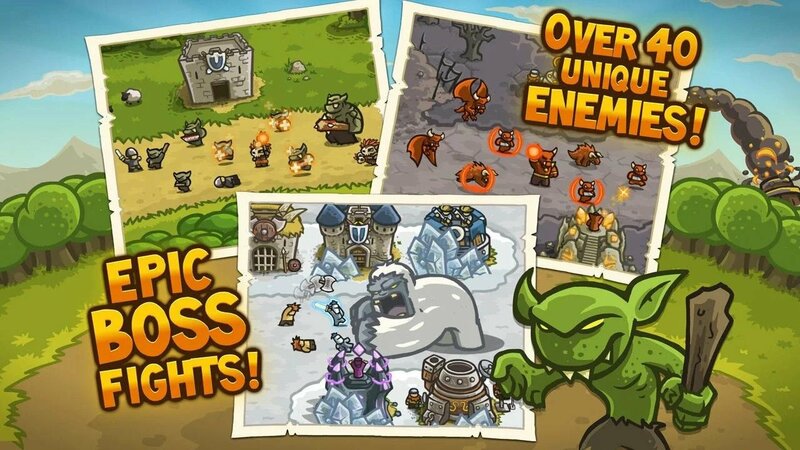 When playing Kingdom Rush, the player encounters nearly 100 different enemies such as Orc, Goblin, Yeti, Dark Slayer … In it, the Goblin is the weakest and most common enemy in the first level. They have only 50 HP and are easily killed by almost everything you have. So, instead of trying to upgrade the tower, you should build more towers and summon more warriors to clean Goblin faster. Each type of enemy has its own weakness, you need to find their weaknesses to have the right tactics. In addition to the defensive towers, the heroes play an important role in killing monsters. Like enemies, the game also has a lot of different heroes. They can be unlocked by buying by gold, cash or you can own by going completely some difficult levels. After passing through the third level of the Campaign Mode, you will be given the first hero of Kingdom Rush – Gerald Lightseeker. Then you can choose any hero you want and buy them when you have enough money. Note: If you create a new profile, the MOD version may not work. I have been playing Kingdom Rush for a long time, but the game is still a lot of fun to explore. Since the game has a huge number of players around the world, you can refer to some great tactics or tips on game discussion forums. If you have something to share, leave a comment below this article. 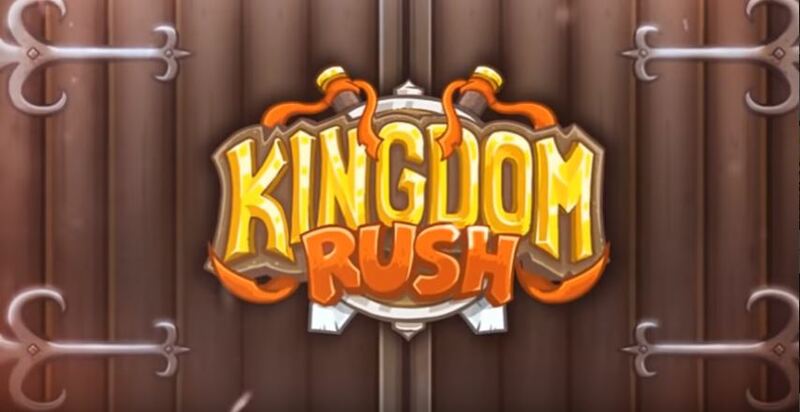 Kingdom Rush MOD APK is ready to download! 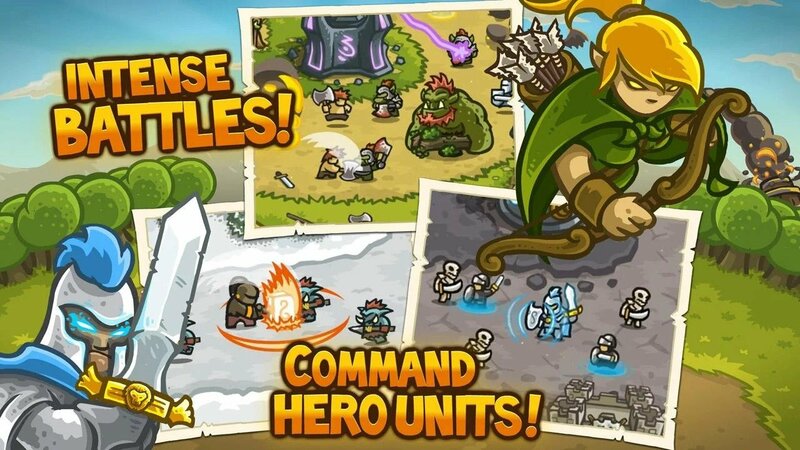 Depending on your needs, you can download Kingdom Rush MOD APK or Kingdom Rush Original APK. Or install from Google Play / App Store if you want.